Stable Transfection of HEK-293 Cells with Rat TRPA1 cDNA and Rat TRPM8 cDNA Containing Plasmids. HEK-293 (human embryonic kidney) cells were grown as monolayers in minimum essential medium supplemented with nonessential amino acids, 10% fetal calf serum, and 2 mM glutamine, maintained under 5% CO2 at 37°C plated on 100-mm diameter Petri dishes, and transfected at approximately 80% confluence with Lipofectamine 2000 (Invitrogen, Carlsbad, CA) by using a plasmid pcDNA3 (Invitrogen) containing the rat TRPA1-cDNA or the rat TRPM8-cDNA (both are kind gift from Profs. Sven-Eric Jordt and David Julius, Department Cellular and Molecular Pharmacology, University of California, San Francisco, CA), according to the manufacturer's protocol. Stably transfected clones were selected by G-418 (Geneticin; 600 μg/ml). Stable transfections were checked by quantitative real-time polymerase chain reaction (PCR). 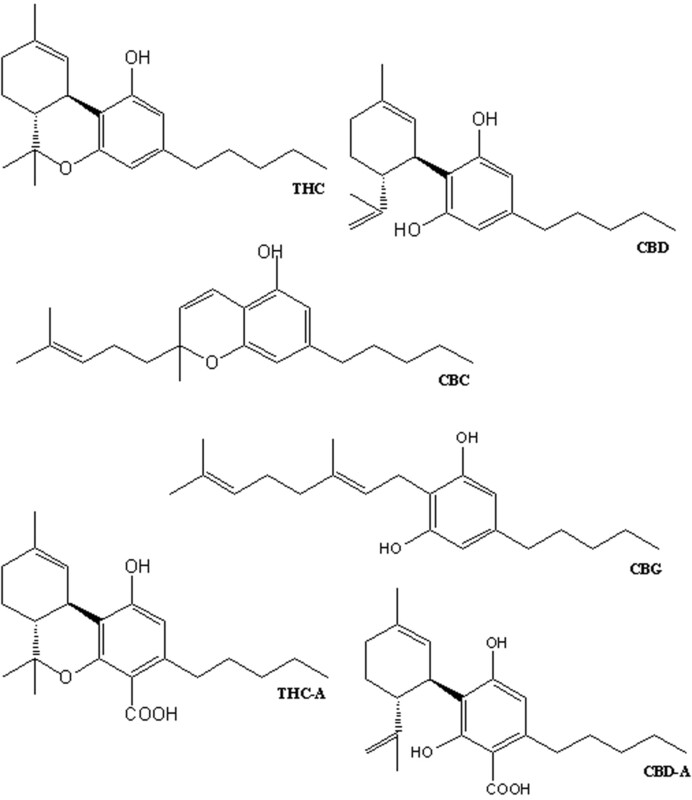 Chemical structures of the six plant-derived cannabinoids (phytocannabinoids) tested in this study. Evaluation of TRPM8 and TRPA1 Receptor Transfection Levels by Quantitative Real-Time PCR. Total RNA was extracted by TRIzol (Invitrogen) according to the manufacturer's recommendations, dissolved in RNA-storage solution (Ambion, Austin, TX), UV-quantified by a BioPhotometer (Eppendorf, New York, NY), and stored at -80°C. RNA aliquots (6 μg) were digested by RNase-free DNase I (Ambion; DNA-free kit) in a 20-μl final volume reaction mixture, to remove contaminating genomic DNA. After DNase digestion, concentration and purity of RNA samples were evaluated by the RNA-6000-Nano microchip assay, using a 2100 Bioanalyzer equipped with 2100 Expert Software (Agilent Technologies, Palo Alto, CA), following the manufacturer's instructions. One microgram of total RNA, as evaluated by the 2100 Bioanalyzer, was reverse transcribed by MoMuLV Superscript III reverse transcriptase (Invitrogen), as described previously. Negative controls (-real-time) were produced by omitting the reverse transcriptase. Quantitative real-time PCR was performed by an iCycler-iQ (Bio-Rad, Hercules, CA) in a 25-μl reaction mixture containing the following: 1× iQ SYBR Green Supermix (Bio-Rad), 10 ng of cDNA (calculated on the basis of the retro-transcribed RNA), and 330 nM for each primer. The amplification profile consisted of an initial denaturation of 2 min at 94°C and 40 cycles of 30 s at 94°C, annealing for 30 s at TaOpt (optimum annealing temperature, see below), and elongation for 45 s at 68°C. Fluorescence data were collected during the elongation step. A final extension of 7 min was carried out at 72°C, followed by melt-curve data analysis. Optimized primers for SYBR Green analysis (and relative TaOpt) were designed by the Beacon-Designer software 6.0 version (Biosoft International, Palo Alto, CA) and were synthesized (HPLC-purification grade) by MWG-Biotech AG (Ebersberg, Germany). Assays were performed in quadruplicate (maximal ΔCt of replicate samples, <0.5), and a standard curve from consecutive 5-fold dilutions (100–0.16 ng) of the cDNAs was included, for PCR-efficiency determination. Relative expression analysis, correct for PCR efficiency and normalized with respect to reference genes β-actin and glyceraldehyde 3-phosphate dehydrogenase, was performed by GENEX software (Bio-Rad) for group-wise comparison and statistical analysis. Experiments in HEK-293 Cells Overexpressing the Rat TRPA1 or TRPM8 Channels. Cells were plated on 100-mm diameter Petri dishes and after 3 days were loaded for 1 h at room temperature with the cytoplasmic calcium indicator Fluo4-AM (4 μM; Invitrogen) containing Pluronic (0.02%; Invitrogen). Cells were washed twice in Tyrode's buffer (145 mM NaCl, 2.5 mM KCl, 1.5 mM CaCl2, 1.2 mM MgCl2, 10 mM d-glucose, and 10 mM HEPES, pH 7.4), resuspended in Tyrode's buffer, and transferred to the quartz cuvette of the spectrofluorimeter (λex = 488 nm; λem = 516 nm) (Perkin-Elmer LS50B; PerkinElmer Life and Analytical Sciences, Waltham, MA) under continuous stirring. [Ca2+]i was determined before and after the addition of various concentrations of test compounds. EC50 values were determined as the concentration of test substances required to produce half-maximal increases in [Ca2+]i. Curve fitting and parameter estimation were performed with GraphPad Prism (GraphPad Software Inc., San Diego, CA). Phytocannabinoids were added 5 min before stimulation of cells with icilin or menthol. IC50 values were determined again using GraphPad Prism, because the concentration exerting a half-maximal inhibition of agonist induced increases of [Ca2+]i. Animals and Cells. DRG were prepared as described previously. DRG neurones from neonatal Sprague-Dawley rats (P7-P14) or adult mice were cultured as described previously (Vellani et al., 2001, 2004). In brief, isolated ganglia were digested in collagenase (type IV; Worthington Biochemical, Lakewood, NJ), mechanically dissociated, plated on glass coverslips coated with poly-l-lysine and laminin (Sigma-Aldrich), and maintained in Dulbecco's modified Eagle's medium (Invitrogen) containing 100 ng/ml nerve growth factor (100 ng/ml-1; Promega, Madison, WI), 10% fetal bovine serum, penicillin, and streptomycin. All animal procedures were carried out in accordance with Italian legislation. Neonatal rats (P7-P14) were killed by decapitation under halothane anesthesia, DRG were isolated, and neurons were dissociated and cultured. For dose-response experiments, approximately 10,000 to 30,000 neurons were used for each data point. Cells were exposed to capsaicin, mustard oil, and ionomycin; all of these treatments, which produce massive calcium influx from extracellular space, caused an increase in calcium in the cytoplasm. 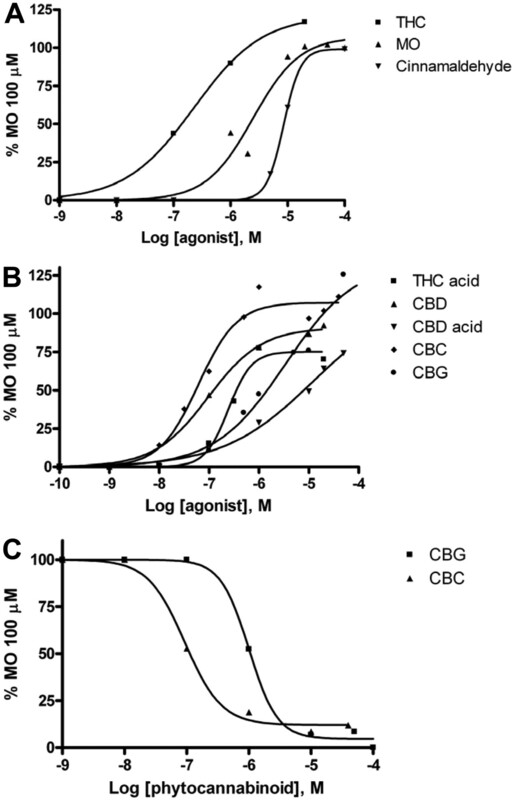 A, dose-related effects of THC, MO, and cinnamaldehyde, or various phytocannabinoids (CBD, CBC, CBG, THC acid, and CBD acid) (B) on [Ca2+]i in HEK-293 cells stably transfected with the rat recombinant TRPA1 channel. No response was observed in nontransfected cells, with the exception of CBD (see Results). C, dose-related effect of 5-min preincubation of TRPA1-HEK-293 cells with CBC or CBG on MO (100 μM)-induced elevation of [Ca2+]i. Data are expressed as percentage of the maximal effect observed with MO. The effect observed for each dose of CBD in nontransfected cells was subtracted from that observed in stably transfected cells. Data are the means ± S.E. of n = 4 separate determinations. S.E. bars are not shown for the sake of clarity and were never higher than 5% of the means. In C, the effect of concentrations ≥10-7 M for CBC, and of concentrations ≥10-6 M for CBG, was statistically significant (P < 0.01, as assessed by ANOVA followed by the Bonferroni test). Phytocannabinoids Mobilize Intracellular Calcium in MO-Responding DRG Neurons. Some phytocannabinoids were also tested in DRG neurons using a calcium imaging approach, and, at a 100 μM concentration, they elicited robust increases in intracellular Ca2+ in a subpopulation of DRG neurons that also responded to MO. Neurons responding to CBC were predominantly of small and medium diameter. In adult mice, the CBC-responding population had an average area of 391 ± 9 μm2, and the whole neuronal population had an average area of 336 ± 7 μm2 (12 coverslips in four cultures); this difference was statistically significant at P < 0.0001. The neurons from neonatal rats responding to CBC were predominantly of small and medium diameter (Fig. 3A), but the presence of some very large neurons increased the mean area of CBC-responsive neurons to 429 ± 20 μm2, compared with an average of 407 ± 9 μm2 for the whole neuronal population (no statistically significant difference). The Ca2+ response to CBC (or MO) was often elicited with a substantial delay: in neurones from neonatal rats, the Ca2+ rise started with a latency of 35 ± 4 s (range, 2–152 s) after exposure to CBC, but once the Ca2+ increase had started, it grew steeply, reaching a peak within 79 ± 3 s from CBC application (range, 22–212 s) (Fig. 3B). This complex kinetics might be related to poor permeability through the plasma membrane or complex actions at the intracellular level, and it has also been observed in a recent study with synthetic cannabinoids (Akopian et al., 2008). The average peak amplitude for 100 μM CBC was 0.79 ± 0.02 ΔF/Fmax (range, 0.05–0.96 ΔF/Fmax). Recovery from peak was rather slow and incomplete, because the Ca2+ response often remained elevated for several minutes even after removal of CBC. In neonatal DRGs, CBC exhibited an EC50 = 34.3 μM (Fig. 3C), whereas CBD and CBG were only tested at 100 μM and were less efficacious, although they acted on a higher number and larger population of neurons (see below, and data not shown). The maximal concentration of CBC tested in DRG neurones (200 μM) was probably nonsaturating, but we did not test higher concentrations due to poor solubility of these lipid compounds and to avoid the risk of nonspecific effects. The lack of available specific antagonists for TRPA1 prevented us from a further pharmacological characterization of the CBC effect in DRG neurons. However, some responses to CBC were seen in neuronal cells that, when further tested with MO, did not respond, probably due to desensitization of TRPA1. Indeed, previous exposure of DRG neurons to low doses of phytocannabinoids, which were unable to produce Ca2+ signals, prevented calcium signals at higher doses. This behavior was observed with CBD, CBC, and CBG (data not shown) and is similar to the one occurring in TRPA1-HEK-293 cells (see Fig. 2C). Effect of CBC on [Ca2+]i in neonatal DRG neurons as assessed by calcium imaging. A, size distribution of MO (100 μM)-responding (light gray) and CBC (100 μM)-responding (dark gray) DRG neurons over the total population (very light gray). B, average kinetics of the response of DRG neurons to CBC (100 μM)—in several cases, the onset of the rise of [Ca2+]i was slower or more rapid. C, dose-related effect of CBC. Data are the means ± S.E. of n = 10,000 to 30,000 neurons. Effect of Phytocannabinoids on TRPM8 Activation by Icilin. As shown previously (De Petrocellis et al., 2007), icilin dose-dependently elevated intracellular Ca2+ in TRPM8-HEK-293 cells, but not in nontransfected cells, with an EC50 of 0.19 ± 0.03 μM. Preincubation (5 min) with different doses of phytocannabinoids, and then continued incubation with icilin (0.25 μM) of TRPM8-HEK-293 cells, caused an inhibition of TRPM8 response to icilin (Fig. 4A). The IC50 values (against icilin at 0.25 μM) were as follows (Hill slopes are between parentheses): THC, 0.16 ± 0.01 μM (1.8 ± 0.1); THC acid, 0.14 ± 0.02 μM (1.9 ± 0.1); CBD, 0.08 ± 0.01 μM (0.8 ± 0.1); CBD acid, 0.9 ± 0.1 μM (1.4 ± 0.1); and CBG, 0.14 ± 0.01 μM (1.0 ± 0.04) (means ± S.E., n = 4). CBC did not inhibit the effect of icilin in these cells. The effects of concentrations ≥10-7 M of all compounds, with the exception of CBC, and of concentrations ≥10-6 M for CBD acid were statistically significant (P < 0.01). A longer (15 min) preincubation time did not dramatically modify these values (between 8 and 15% increase; data not shown), whereas shorter preincubation times were not tested. 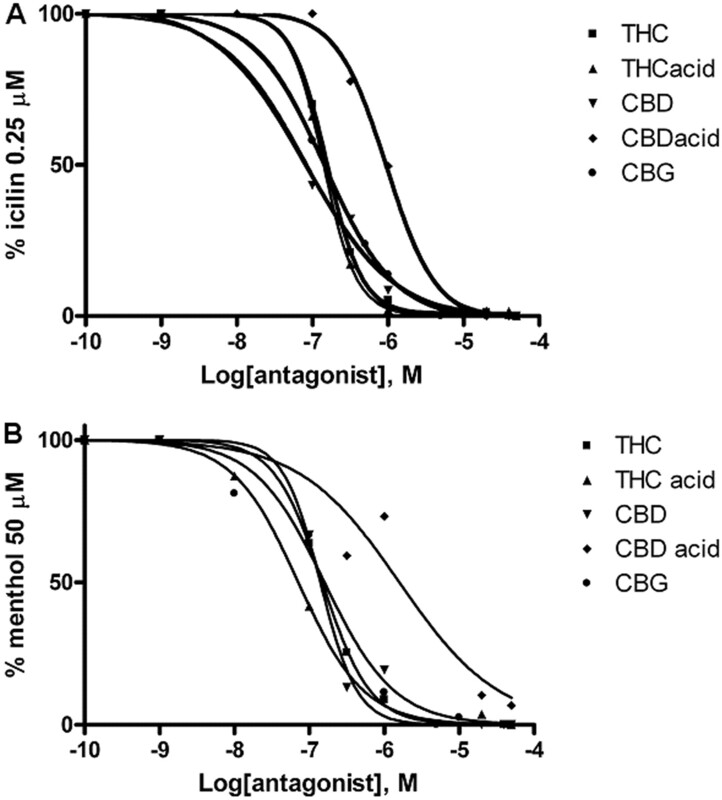 Effect of Phytocannabinoids on TRPM8 Activation by Menthol. In agreement with previous studies (De Petrocellis et al., 2007), menthol dose-dependently elevated intracellular Ca2+ in TRPM8-HEK-293 cells, in a way mediated by TRPM8 because no effect was detected in the wild-type HEK-293 cells under similar conditions (data not shown). The EC50 for menthol was 40.9 ± 15.1 μM. Pretreatment (5 min), and then continued incubation, of TRPM8-HEK-293 cells with phytocannabinoids reduced the effect of menthol on [Ca2+]i in a dose-dependent manner (Fig. 4B). The IC50 values (against menthol at 50 μM) were as follows (Hill slopes are between parentheses): THC, 0.15 ± 0.02 μM (1.4 ± 0.1); THC acid, 0.07 ± 0.01 μM (1.0 ± 0.1); CBD, 0.14 ± 0.01 μM (1.7 ± 0.4); CBD acid, 1.6 ± 0.4 μM (0.7 ± 0.2); and CBG, 0.16 ± 0.03 μM (0.9 ± 0.2). CBC did not inhibit the effect of menthol in these cells. The effects of concentrations ≥10-7 M of all compounds, with the exception of CBC, and of concentrations ≥10-6 M for CBD acid were statistically significant (P < 0.01).